The Amoena Natura Light 2S Ultra Soft Breast Form is ideally suitable for women following breast surgery. The Amoena Natura Light 2S prosthesis is designed to drape softly so that it closely resembles the form of a women's own breast. The Amoena Natura Light 2S Ultra Soft Breast Form is ideally suitable for women following breast surgery. The Amoena Natura Light 2S prosthesis is designed to drape softly so that it closely resembles the form of a women's own breast. With an outline that's as natural as it was before your surgery, you'll feel comfortable and confident: no one will know your're wearing a prosthesis. 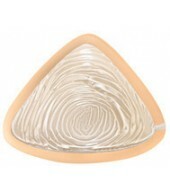 The Amoena Natura Breast form are supplied in a soft carry case for discreet storage. Special features includes soft texture (Natura is ultra soft silicone layer) and silkiness of touch. The forms are covered in new supersoft film and now also with comfort and temperature balancing technology. Made in Germany.